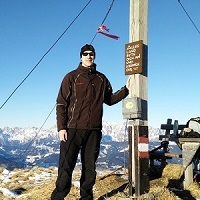 When trails and mountains are covered with snow, hiking becomes challenging and requires additional gear and skills. Trudging through soft deep snow is very exhausting, but you can make it less exhausting by wearing snowshoes. Snowshoes allow you to hike on snowy terrain without sinking in too deep. A snowshoe consists of a rigid frame with a flexible deck inside and crampons which are distributed along the frame and under the bindings. Therefore, snowshoes also provide traction besides flotation. Modular tails can be attached to some snowshoes in case that increased flotation is required – like for example when you are carrying a heavy backpack or hiking on a terrain covered with powder snow. Snowshoes can be used with any hiking boots but work best with boots that have relatively stiff soles (see backpacking boots). When hiking with snowshoes on, trekking poles are usually used for better balance and gaiters for keeping the snow out of the boots. Those who are new to winter hiking are often confused about the difference between snowshoes and crampons. The big and important difference is that snowshoes are designed for terrain covered with soft and deep snow where flotation is required while crampons are designed for icy terrain where traction is required. Even though snowshoes also provide some traction, they are not the best option for icy surfaces as they provide inferior maneuverability and traction in comparison to crampons. Furthermore, they are also heavier and bulkier. 1. Buying Snowshoes for Hiking – What is important? In this review we only listed snowshoes which provide superb flotation-to-weight ratio. All products in this review weigh less than 6 pounds per pair. Lightweight equipment allows you to hike faster and easier. Snowshoes have either oval or tapered frames. Your shoe size is NOT what determines the appropriate frame size; this is instead determined based on your weight (the heavier, the larger frame size), type of snow cover (the softer, the larger frame size) and terrain (smaller size for better maneuverability). A large frame will of course impede your maneuverability and in general you should try to aim for the smallest size possibly to fit your needs. A (very) general rule of thumb is that for every kilogram of body weight, a snowshoe should cover a surface of 2 square inches. However, this rule doesn’t take the type of snow cover into consideration. Most snowshoes are available in different sizes to cater to hikers with different needs and weight (body weight + backpack). The tail is the back part of the snowshoe and is very important for flotation. Some snowshoes have integrated tails (they are part of the frame) while others have modular tails. A modular tail can be attached to increase the flotation and detached when high maneuverability is required. This selection contains two products which are compatible with modular tails. The decking is the material that fills out the frame and is made either of synthetic materials or composite materials. The deck should provide good puncture- and impact-resistance. The bindings are used to secure the snowshoes to your boots and are usually made of straps that go over the foot and around the heel. There are two types of bindings – rotating bindings and fixed bindings. Rotating bindings pivot at the point where they are attached to the snowshoe, so that the end of the snowshoe drops down when you lift your foot. This allows you to maintain natural movement and easily walk uphill. The only downside of rotating binding is that it’s hard to cross obstacles (fallen trees) in them as the tail drops down whenever you lift your foot. Fixed bindings don’t pivot and thus the snowshoe is always aligned with your foot. These bindings allow you to easily cross obstacles but walking uphill in them is difficult. In this selection we only listed products with rotating bindings. Snowshoes are equipped with crampons to provide traction. Usually the crampons are placed under the bindings, in the heel area and on the sides. Crampons under the bindings cut into the snow when you lift your heel (they pivot with your foot) thus allowing you to walk forward without slipping. Crampons in the heel area slow you down during descents and crampons on the sides provide you with the traction when traversing. Heel lifts are metal bars that can be lifted under the heel when you are going uphill. They place your heel higher and thus reduce the strain on your calves. To learn more about heel lifts, read this article from snowshoes.com. Snowshoe frames are made either of metal (aluminum etc.) or composite materials (plastic, carbon fiber). The decking can be made of composite materials or synthetic material such as impregnated nylon, rubber or synthetic leather. 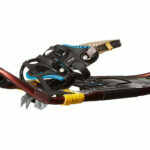 The crampons are usually made of stainless steel or aluminum while the bindings are in most cases made of durable nylon. The MSR Lightning Ascent snowshoes are perfect for hikers and mountaineers who often hike on steep terrain. They feature a lightweight aluminum frame which provides superb durability and traction. The whole frame is basically a crampon – there are teeth on the edges and three rows of split teeth across the sole. 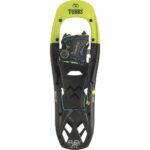 This design provides 360° traction and allows you to safely hike on slippery slopes. The decking inside the frame is lightweight but durable. The Lightning Ascent use PosiLock freeze-resistant rotating bindings which securely attach your hiking boots to the them. The bindings consist of three straps that go over the foot and one strap that goes around the heel. Two additional crampon teeth are under the bindings and cut into the snow when you lift your heel. The Lightning Ascent are also equipped with heel lifts (Ergo Televators) which can be easily lifted with a trekking pole. They can be worn in different conditions because they are compatible with 13 centimeters long MSR tails (sold separately). They are best for those who want a high-quality solution for hiking in snowy conditions – they can handle deep snow as well as icy terrain. 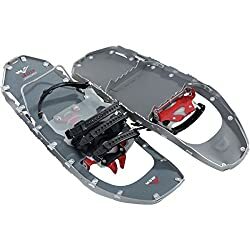 The MSR Revo Explore snowshoes are in comparison to the MSR Lightning Ascent less expensive but on the other hand they also don’t offer as good traction. 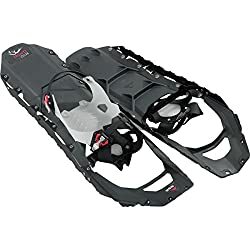 They feature a lightweight aluminum U-shaped frame which is equipped with crampon teeth along its edge and one row of crampon teeth across the sole. The crampon teeth are less aggressive than those on the Lightning Ascent. The decking is made of a lightweight plastic material which provides good durability at low temperatures. The MSR Revo Explore are equipped with a HyperLink rotating binding system which is super easy to use. Additional rotating crampon with two teeth is under the bindings. For steep terrain, they feature heel lifts (Ergo Televators). They are also compatible with MSR modular flotation tails and thus highly adjustable. This product is perfect for those who mostly hike on flat and semi-steep steep terrain. The Tubbs Flex VRT snowshoes are very durable and provide great traction, even on steep icy slopes. They feature a U-shaped aluminum frame which is equipped with traction rails (crampon teeth) along the edges. The tail (made of composite materials) is flexible and thus it efficiently absorbs shocks from heel strikes. This significantly reduces the stress on your joints. 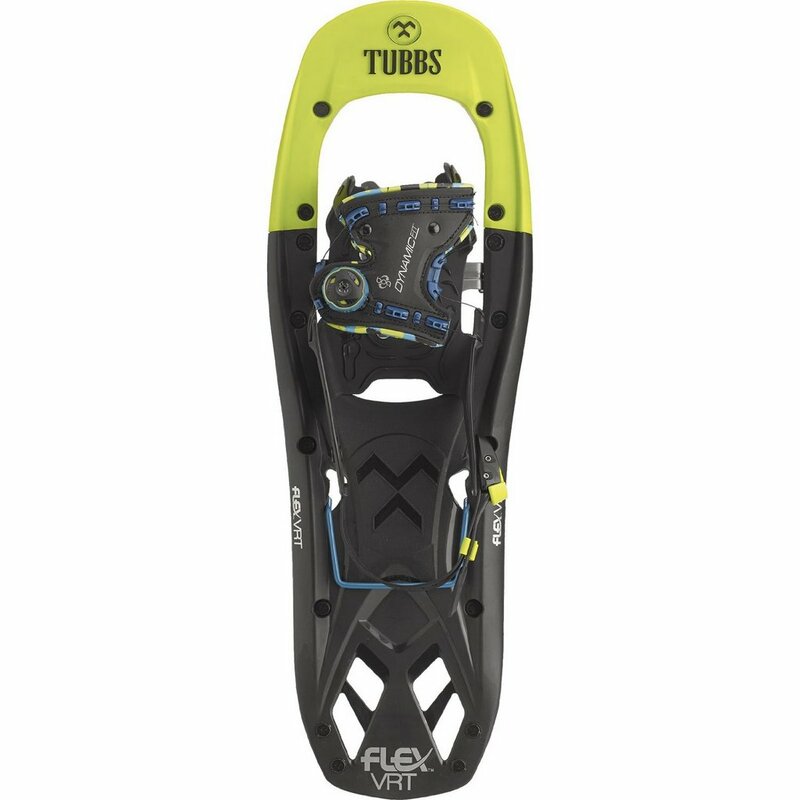 The Tubbs Flex VRT use rotating DynamicFit bindings with the Boa closure system for precise fit and optimized control (your boot is tightened to the snowshoe simply by rotating a button on the bindings). 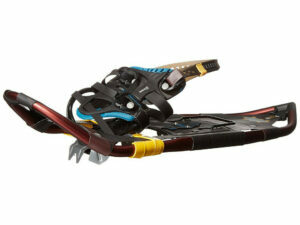 A Viper 2.0 carbon steel crampon is under the bindings. In comparison to the MSR Lightning Ascent crampons, the Tubbs Flex VRT have a much bigger crampon under the bindings but on the other hand they are not equipped with crampon teeth across the sole. 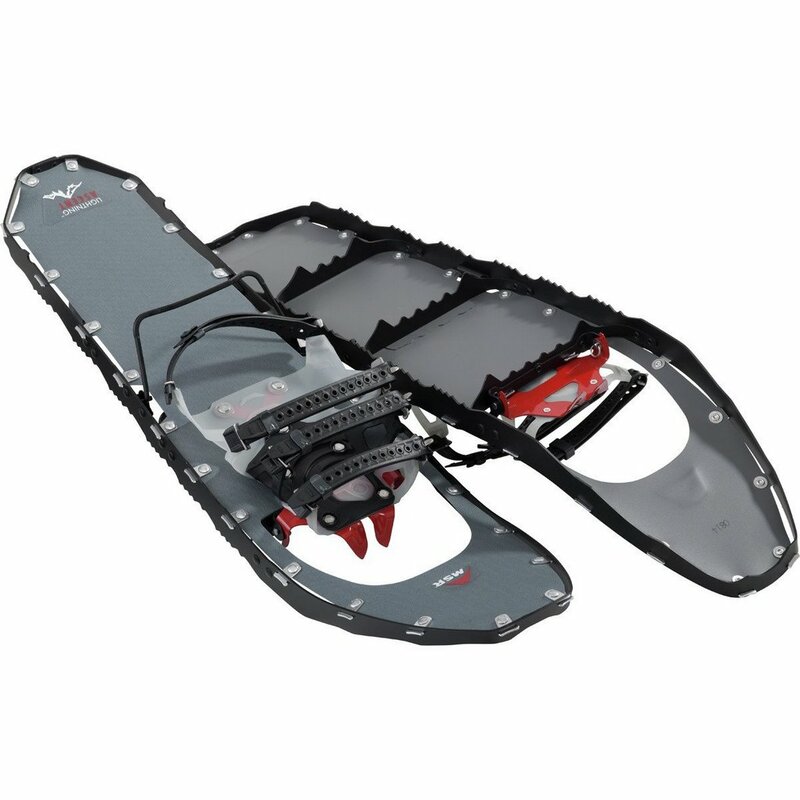 The Atlas Access snowshoes are very durable and provide great functionality on different terrain types. They have an elliptically shaped frame which is made of aluminum for good durability. The frame features a decking made of a lightweight composite material. There are no crampon teeth on the sides, but they are on the bottom and under the bindings. The Atlas Access also feature the Light-Ride Suspension which absorbs the impact when walking and enhances the traction (deeper crampon penetration). They are equipped with Wrap Trail bindings which are easy to use. They are best for those who want a pair of versatile snowshoes for a very reasonable price. The Atlas Treeline snowshoes differ from the Atlas Access in frame material and crampons. The Atlas Treeline is equipped with more aggressive crampons and has a stronger frame. Hence also the price is a little higher. 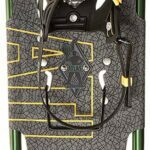 These Atlas snowshoes use a relatively large heel crampon which is placed directly underneath the heel lift (for deeper penetration). 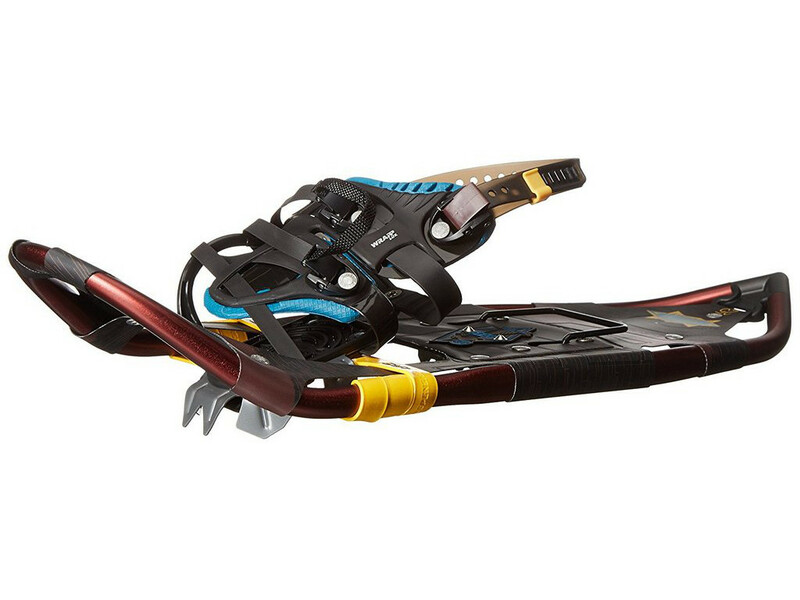 In addition to the heel crampon, they also have a large rotating crampon under the bindings (All-Track). They use Wrapp Lux bindings which are easy to use. They consist of silicone straps which can bed tightened by one easy pull. The frame is made of aluminum and uses Nytex decking. The Atlas Treeline also feature light-ride suspension for comfortable walking. What size of snowshoes to get? The size of snowshoes should not be selected on the basis of your footwear size, but according to your weight (the heavier the user, the larger the snowshoes), snow cover and terrain. To get snowshoes in the right size for your needs, check the manufacturer’s website where you will find information about which size fits your weight. Do you need poles with snowshoes? Trekking poles are very useful for snowshoeing because they help you with traction and balance. Note that trekking poles for snowshoeing should have wide baskets so they don’t sink too deep in the snow. What kind of shoes do you wear with snowshoes? You can wear any kind of shoes with snowshoes, but we do recommend wearing water-resistant and relatively stiff hiking/backpacking boots for best fit and comfort. How much snow do you need for snowshoeing? Snowshoes are intended for deep and soft snow. In any other conditions it doesn’t make sense to wear snowshoes because they are heavy and bulky. Note that on frozen hard terrain you will be better off with crampons.